The perfect cleaning and repair mat for your M1 Garand. Have fun and learn while you work on your favorite long gun. The soft top protects your gun from scratches while the neoprene rubber backing protects your work surface from chemicals while keeping everything in place. This isn't your ordinary gun cleaning mat! Show your pride for your firearm while using this high quality neoprene rubber backed and cloth top gun cleaning mat to protect your gun bench, desk, kitchen table, or whatever surface you usually clean or maintain your gun on. You likely keep your gun in a soft padded case or maybe a gun cabinet with a felt lined rack or something similar to protect it so why would you scratch your gun while cleaning or repairing it by setting it on a hard surface that could easily scratch your firearm? With the exploded view drawings and accompanying parts list, making repairs, disassembling your firearm, or basic cleaning can be done much faster and with greater enjoyment. Guns are extremely fascinating and the drawings and data that is printed on each mat will keep you entertained while educating you on how your firearm operates. QUALITY GUN CLEANING MAT - This M1 Garand gun cleaning mat by TekMat is made to exacting standards. This begins with the waterproof, scratch proof, fade and oil resistant dye-sublimation printing. LARGE, CLEAR DESIGN - This M1 Garand gun cleaning mat measures 12" x 36" and is 3mm thick. It gives you plenty of room to disassemble your M1 Garand long gun and to clean it without having to move parts all over. 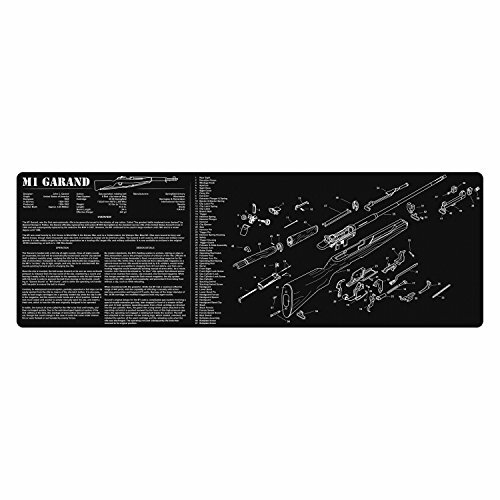 EASY TO USE - This M1 Garand gun cleaning mat comes with an overview of the history of the M1 Garand as well as a simple to follow parts diagram that make up your M1 Garand. LIFETIME QUALITY - Designed in Salt Lake City, UT this M1 Carbine gun cleaning mat will last a lifetime and will always be a great accessory to your M1 Garand long gun.